The No. 4 seeded BYU women’s volleyball team is headed to their seventh straight Sweet 16 appearance in the NCAA tournament after straight-set wins over Stony Brook (25-20, 25-13, 25-12) on Friday, Nov. 30 and rival Utah (25-16, 25-21, 25-18) on Saturday, Dec. 1. The Cougars hosted the first two rounds of the tournament because of their top seed on their side of the bracket. Against Stony Brook, outside hitter Roni Jones-Perry led the team with 17 kills on a 0.297 hitting percentage and added six digs with four blocks. Middle blocker Heather Gneiting chipped in six kills and four blocks, while outside hitter Madelyn Robinson also had six kills and added a block. Middle blocker Kennedy Eschenberg had a team-high six blocks and added four kills. After starting their first match on a 4-0 run, the Cougars allowed Stony Brook to come back and take an 11-8 lead, forcing Olmstead to take a timeout. Both teams played back and forth afterward until a service ace by outside hitter Danelle Stetler gave BYU a 20-19 lead. The Cougars then went on a 5-1 run to finish off the set, highlighted by a Jones-Perry kill and a series of attack errors by Stony Brook. The ensuing two sets were all BYU, as Stony Brook could not seem to get much going offensively against the Cougars’ defense. Stony Brook middle blocker McKyla Brooks talked about how tough it was playing against BYU’s middle blockers. 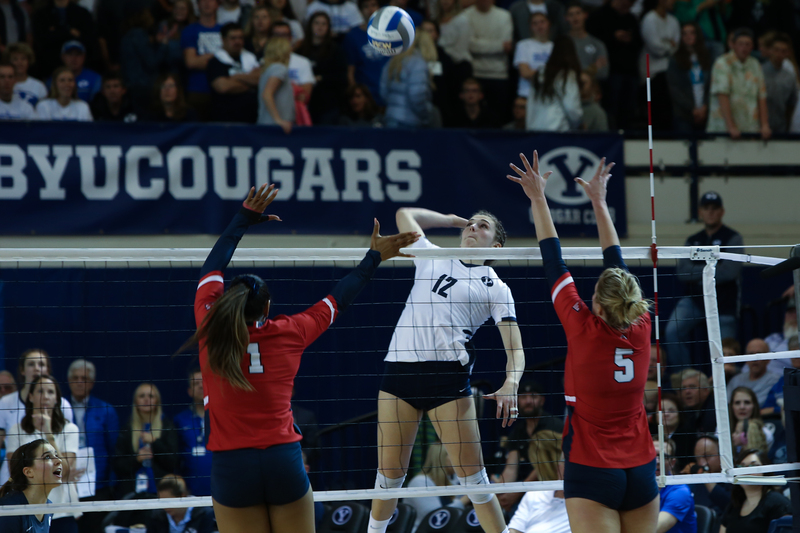 The win over Stony Brook set up a rematch between BYU and rival Utah, who played each other during the season at the Smith Fieldhouse back on Sept. 13. The Cougars dominated that regular season match as well (25-20, 25-14, 25-17). Jones-Perry once again led the Cougars against Utah with a team-high 20 kills on a 0.471 hitting percentage. She also added seven digs and three blocks for BYU. Gneiting had another big night for the Cougars, recording 12 kills on a 0.688 hitting percentage and adding two blocks. Stetler led the team in digs with 12. Setter Lyndie Haddock-Eppich, who led BYU with 45 assists on the night, talked about what was working so well for the team offensively against Utah. The first set against Utah started off back and forth until Utah took an 11-10 lead. From there, however, it was all BYU. The Cougars went on a 7-0 run, highlighted by three Jones-Perry kills and one by Eschenberg, forcing Utah to call a timeout. From there, BYU went on a 7-5 run to take set one. 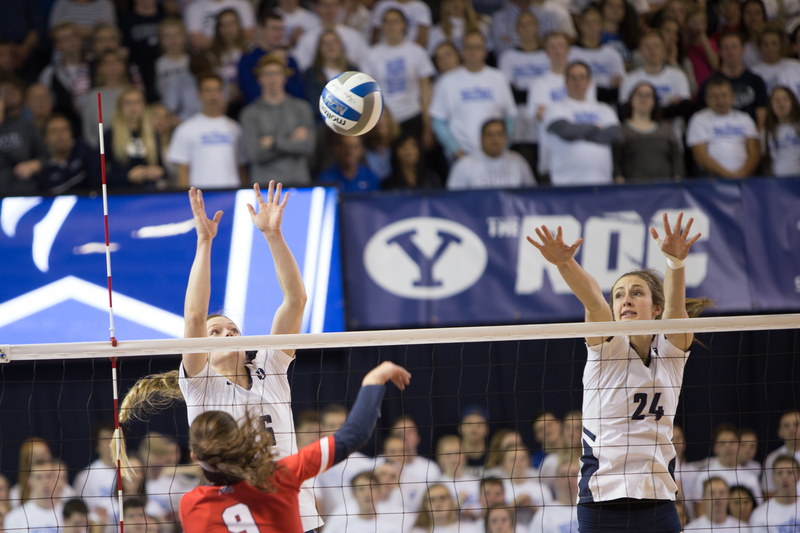 Utah head coach Beth Launiere talked about the influence BYU’s runs had on the match. Utah hung around in the second set and was never down by more than six points throughout the frame. However, they never led, and BYU went on to take the set 25-21. The third set was all BYU, as they once again never trailed the entire set and took the 25-18 win to win the match and advance to the Sweet 16 for the seventh year in a row. The Cougars now face Florida in the regional semifinal round on Friday, Dec. 7, at the Smith Fieldhouse. The Gators also swept their first two matches in the tournament against Florida State and Florida Gulf Coast. Whichever team wins will face the winner of No. 5 Texas and Michigan, whose match will also be played at the Smith Fieldhouse on Friday, Dec. 7. The regional final is set to be played in the Smith Fieldhouse as well the following day, Saturday, Dec. 8, with a trip to the Final Four on the line.